Here is an unusual question for you. I have a bigger than normal population of rabbits and gophers who are burrowing holes under my mare motel cover area. I am sure they are just trying to get out of the heat and I don’t want to trap or kill them. I have used sonar repellers to handle the problem in my yard and have had great success. I would like to place some around my horse facilities as well. Can you tell me if these devices can be used safely around horses? You’re right, this is an unusual question! Fortunately I know exactly the devices you mean, as my husband and I have a sonic mole chaser in the backyard of our home that does an excellent job keeping these rodents away. We’ve talked about using these rodent repellers at the barn where I board my horses, because there are some dangerous groundhog holes in some of the pastures. But we weren’t sure if they worked on larger pests such as these, how many units it would take to cover several acres, and, like you, if they were safe around horses. The basic principle of these devices is that they create a sound wave between 300 and 400 Hz which penetrates most soil types, irritating underground dwellers and causing them to leave. Units pulse this sonic burst anywhere from every eight seconds to every 30 seconds. The websites of various models say “safe for pets and humans” and “will not harm the environment” but this doesn’t really answer your specific question about horses so I contacted one of the companies that manufactures this type of product. 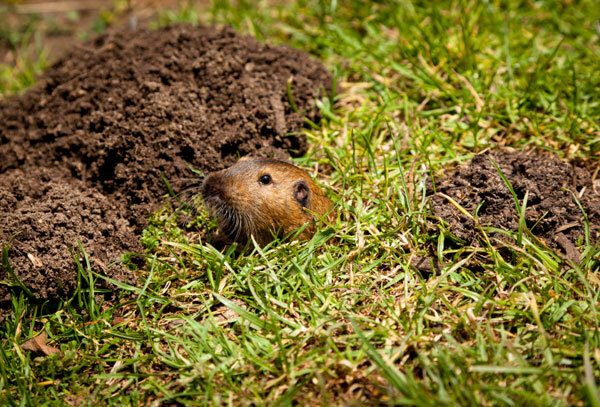 Unfortunately, they had no information about the use of ultrasonic mole chasers specifically around horses, although they did say moles, voles, shrews, prairie dogs, chipmunks, ground hogs and gophers are all repelled. While I can think of no particular reason why the sound or vibration would be harmful to horses, the whirring sound and shaking sensation may scare them at first, so be sure and introduce the device gradually. Make sure your horses are completely comfortable with the repeller before you attempt to lunge, ride or otherwise work your horse in the area. Then give it time to work (most sites said 7 to 14 days) and adjust placement as needed to permanently drive ground-digging animals away from your horse facilities. By the way, did you know that a group of moles is called a “labor” of moles?